for a special or romantic "get-a-way"! 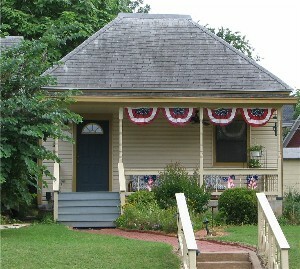 The Cottage at the Seely House is a Bed and Breakfast (B&B) located in historic Guthrie, Oklahoma. The Cottage is cozy and comfortable - just perfect for that special romantic "get-a-way," honeymoon, anniversary, or birthday. The Cottage at the Seely House B&B is located in a quiet, residential neighborhood near downtown Guthrie, OK. The Cottage has been beautifully restored and decorated in an exotic British Colonial decor. We serve a large and tasty breakfast in your room. You can enjoy a relaxing evening sitting on the porch or spending time together in the Jacuzzi tub for two. A fireplace in the bedroom sets the mood for romance. There is a small, separate sitting room with wet bar, refrigerator, and microwave for your use. The Cottage features a gas fireplace, Dish TV, and queen-size bed. The city of Guthrie offers an array of antique stores, gift shops, musical shows, professional live theater, five public golf courses, and seven museums – all in a romantic turn-of-the-century historic town. The Guthrie trolley provides a relaxing view of the Guthrie sites and neighborhoods. You can arrange for a carriage to pick you up at the Cottage for a romantic ride around town or to dinner or the theater with a ride back to the Cottage when you’re ready. We look forward to meeting you on your next visit to historic Guthrie, the B&B Capital of Oklahoma. for that special pilot getaway in Guthrie. This is the website of the Cottage at the Seely House Bed and Breakfast. You may contact us at SeelyHouseBB@sbcglobal.net or phone 405-282-8889.